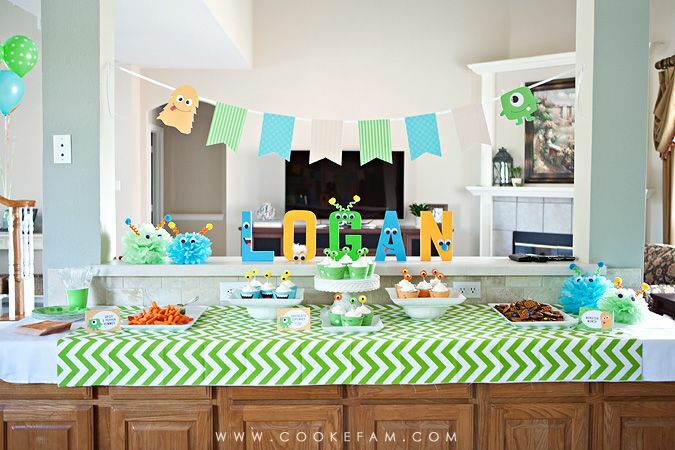 A few weeks ago we had a family party at our house to celebrate Logan's 2nd birthday. 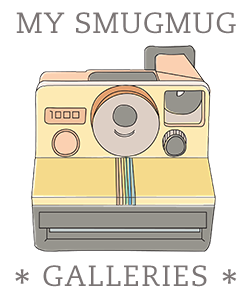 Usually I come up with a theme for the party based on what they are into at the time, or maybe an idea I saw somewhere (Pinterest, anyone?). But this party came straight from something I was cleaning out of his dresser several months ago...a baby bib. When I saw it as I was sorting through baby items, it immediately inspired this party in my mind and I set it aside on my desk. I loved the colors and the cute little monster. 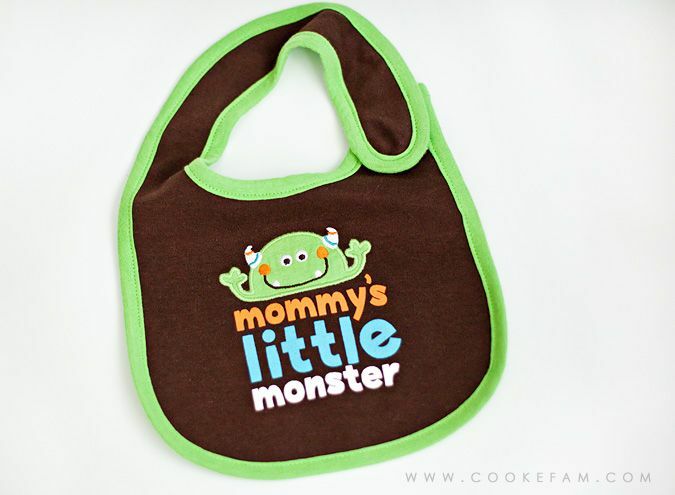 And what better represents an energetic two-year-old than a sweet little monster! 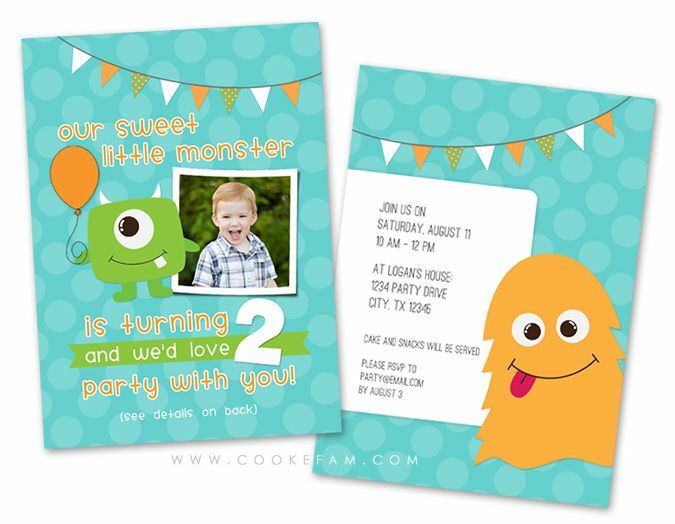 So, here's the invitation I created using the "Cute Monsters Creator" clip art set by Cloud Street Lab on Etsy. 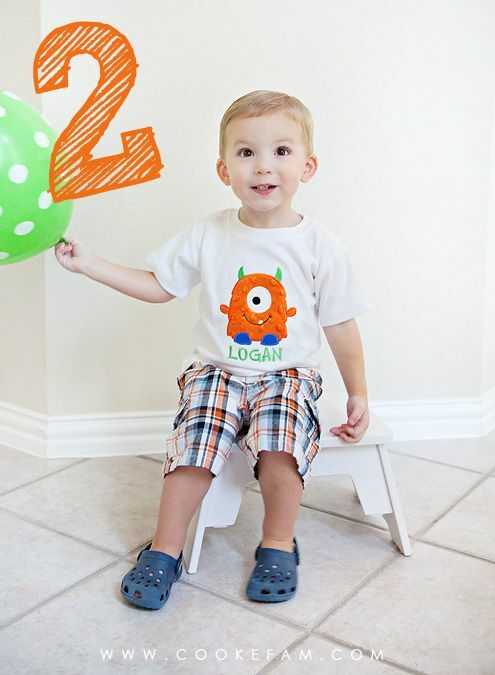 And here's Logan, ready for his party. He had a cold the week of his party and was still congested that day, but he was still really happy and up for the festivities. I got his little monster shirt from Lions & Lilly Pads on Etsy. I love this shirt because it really fits his personality and it is one of those wonderful, thick t-shirts that are he can wear several more times (and already has) before it gets cooler around here. 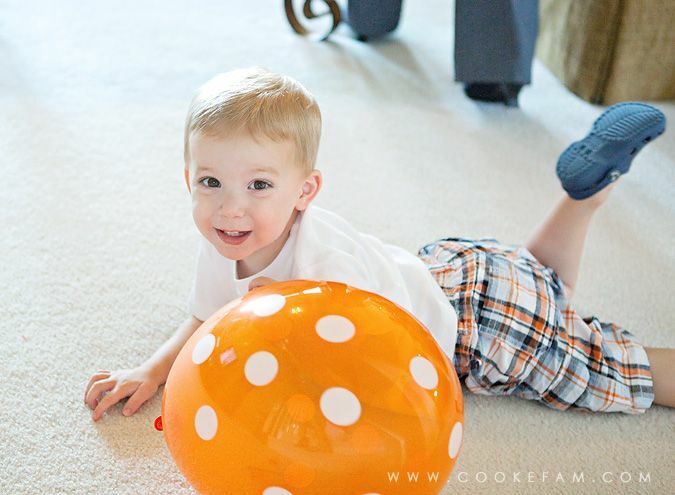 I have no idea why he insisted on wearing his crocs during the party. That definitely was not part of what I had planned for him to wear! But the boy knows what he wants, that's for sure. I kept the decor and menu really simple, and as a result, this was one of the most stress-free parties to plan and execute. I got the green zig-zag fabric for the tables from Modern Cloth on Etsy. I got these paper mache letters at Hobby Lobby. I just painted them and added a few simple accessories to give the impression of "letter" monsters. Ethan actually got a big kick out of these. And they were really fun to make! 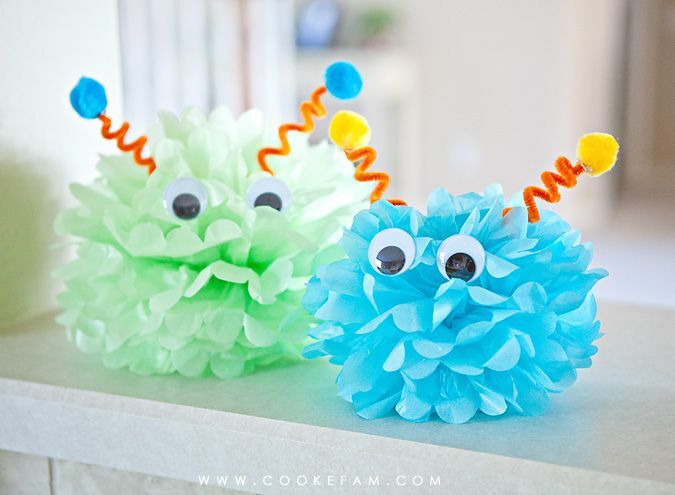 These pom-pom monsters were created using the tissue paper pom-poms I used at Logan's first birthday party. I usually don't keep/store things like that after a party, but for some reason I couldn't part with them since they were still in such good condition. So, I tucked them away in a large gift bag in a closet, and forgot about them. Then I saw someone make monsters out of them for party decorations and I was immediately glad I had kept them. Hurray for re-purposing decorations! I used these on the food table as well as for the table centerpieces. For the cake, I went back and forth on whether to make a monster cake with "hairy" icing that I saw on Pinterest and loved. 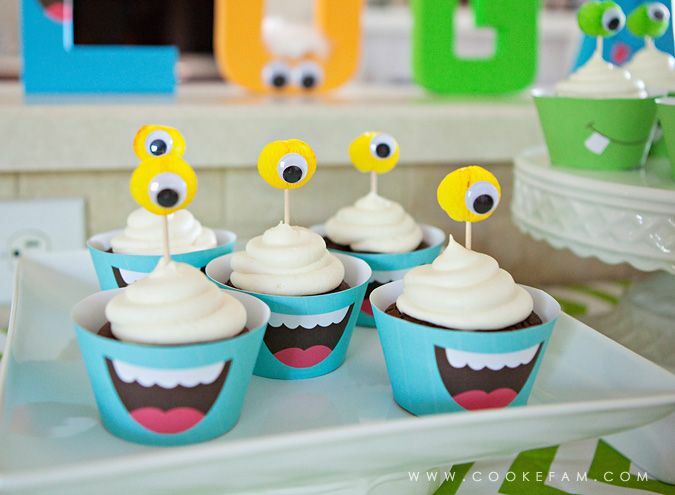 Or the cute, colorful monster cupcakes that I also loved. Ultimately, I spied these little drink accessories/sticks at Hobby Lobby on sale in the party aisle with the luau stuff. 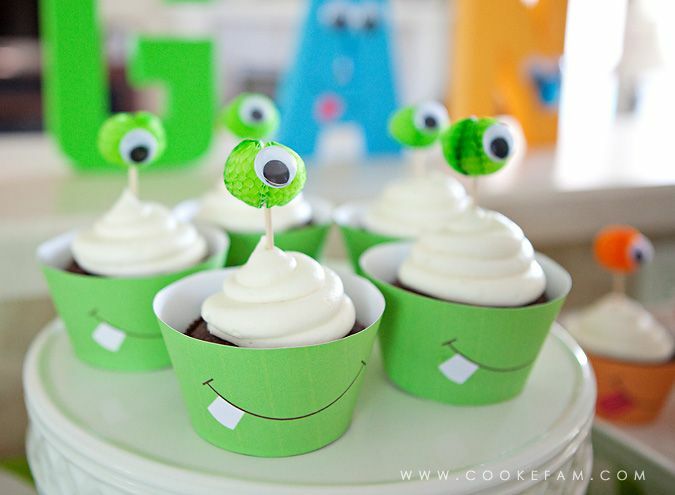 When I saw them, my mind saw eye balls and I decided to do my own version of monster cupcakes. They turned out exactly how I saw them in my mind that day. 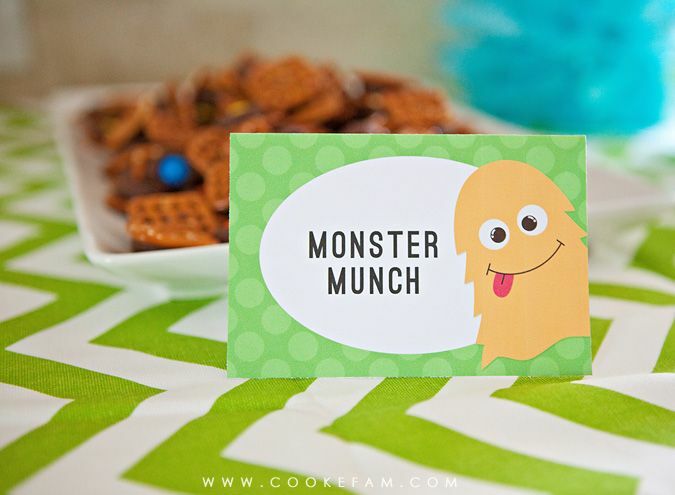 For the cupcake wrappers, I just downloaded a template I found online and created my own monster smiles in Photoshop using the same monster creator elements I had used for the invitations. 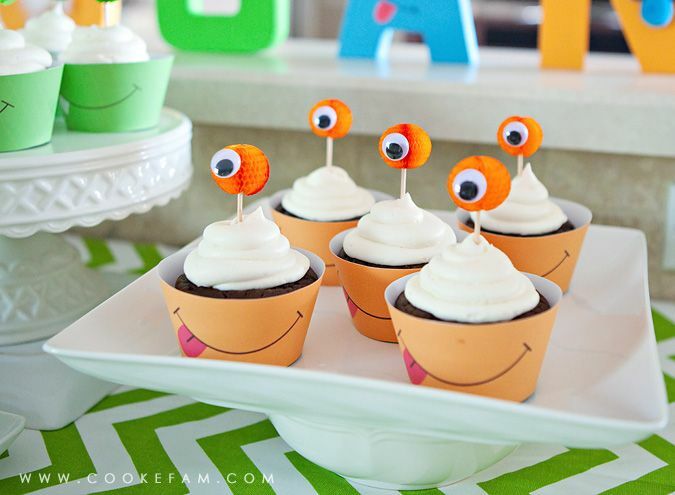 This turned out to be a good idea for me because I can design things in Photoshop and wield my glue gun (for the googly eyes) much better than I can decorate a cake. The only piping skills I had to use for these cupcakes was a big swirl of buttercream icing with an extra large Wilton tip. Easy. I didn't even color the frosting like I had thought I would. I also printed up a few food/drink labels for our guests to know what they were eating or drinking (on those things that were not obvious). This particular party food (below) was the completely addictive pretzel-M&M-Hershey's Kiss combo that I will be making for every occasion I can imagine. We also had pulled pork sandwiches and other minor side items. 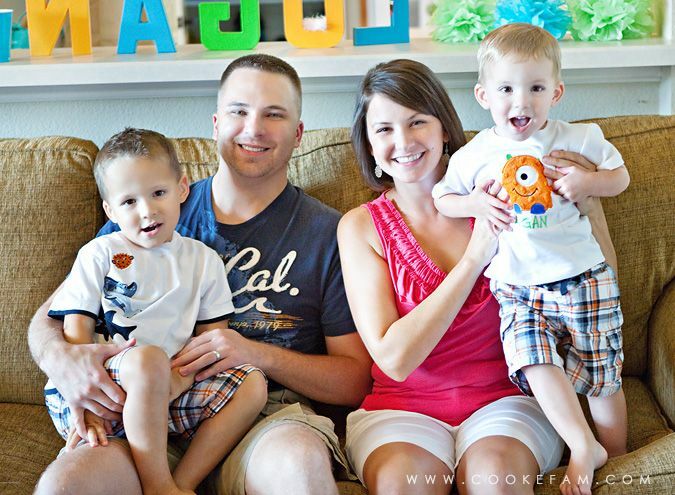 The first thing we did was watch a video I put together of Logan's first two years (in photos). This stemmed from my shortfall last year at his first birthday party...I forgot to play the video I had made! And I was so mad at myself. So this year, I added in photos from his second year and we actually watched it at the party! 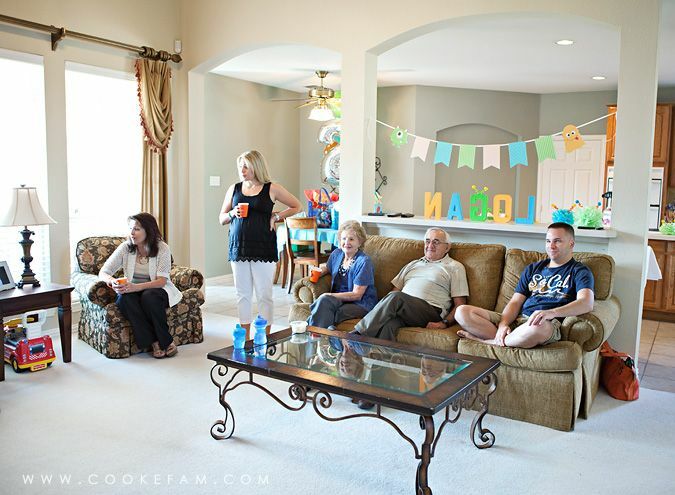 Family members don't mind (and may even enjoy) watching 10+ minutes of photos of the birthday boy. Logan enjoyed it too. This child can be found in this position just about every time he watches TV. For some reason, he loves to touch his belly button. 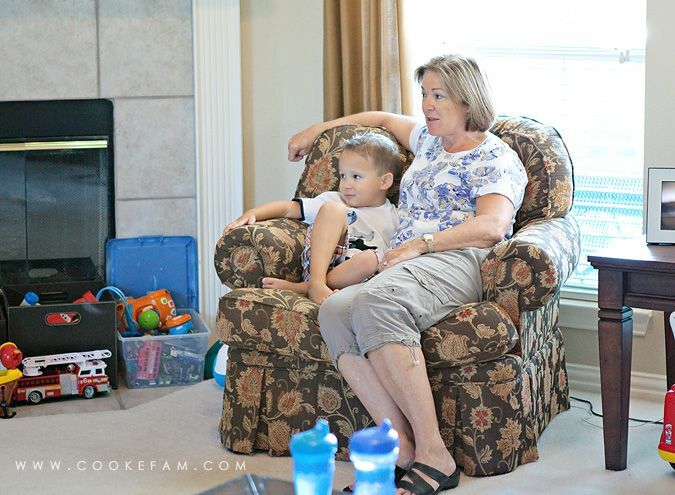 Ethan and Mimi watching photos of Logan. Ethan actually loved looking at the old photos. 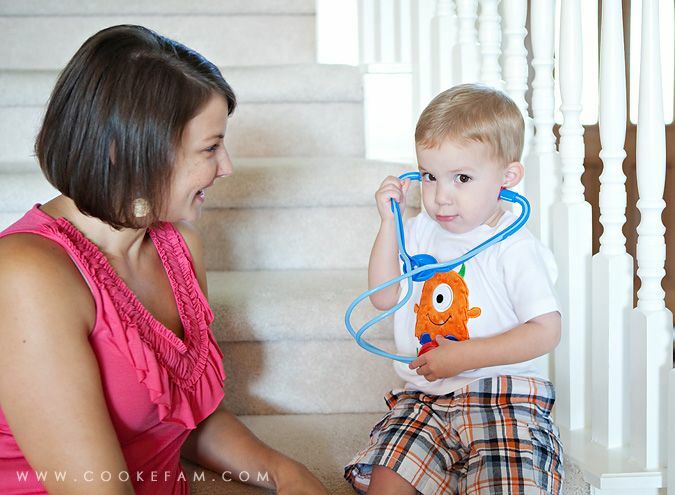 After the video, Logan took a quick break to give me a check up. Except he's listening to his own...stomach? For our last two parties I have blown up a few balloons myself in stead of using helium. My boys love to play with them. They are actually still in our living room and were played with just today. Cheap thrills. Then, we took an unorthodox route and opened presents early in the party (with the video playing in a constant loop in the background). 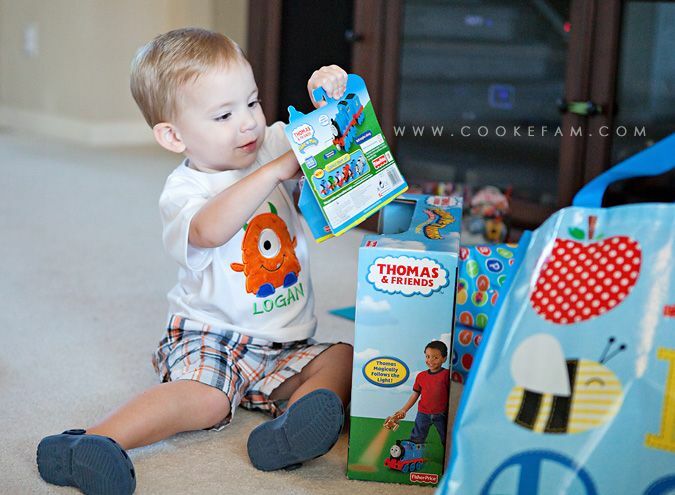 Logan was in heaven opening all these toys just for him. What a treat! 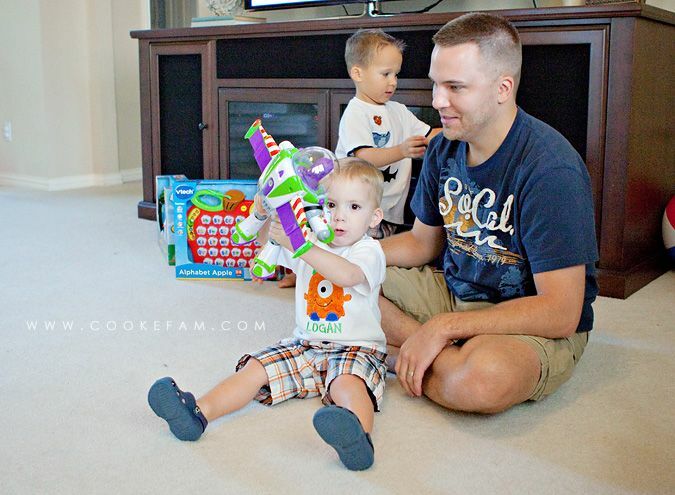 This Buzz Lightyear figure (which is actually a really cool toy), was a gift from Ethan. He picked it out all by himself one day when it was just me and him at Target. I think he may have had in mind for Logan to share it with him (which he does), but when Ethan saw it that day, he said, "Mom! Logan loves Buzz! He will love that toy." 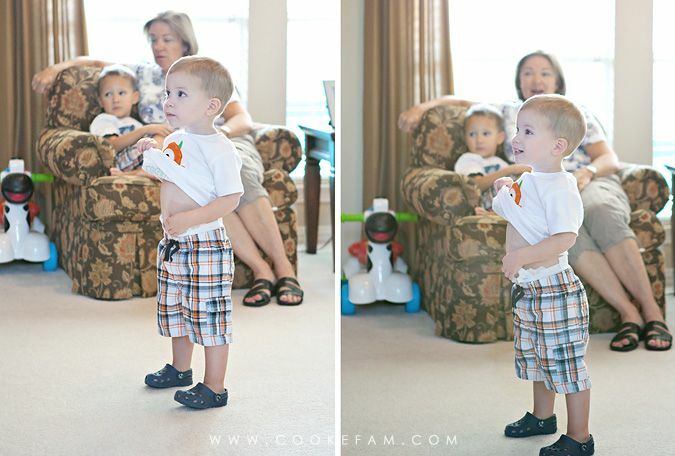 I love that he picked something out for his brother that he knew he would love. 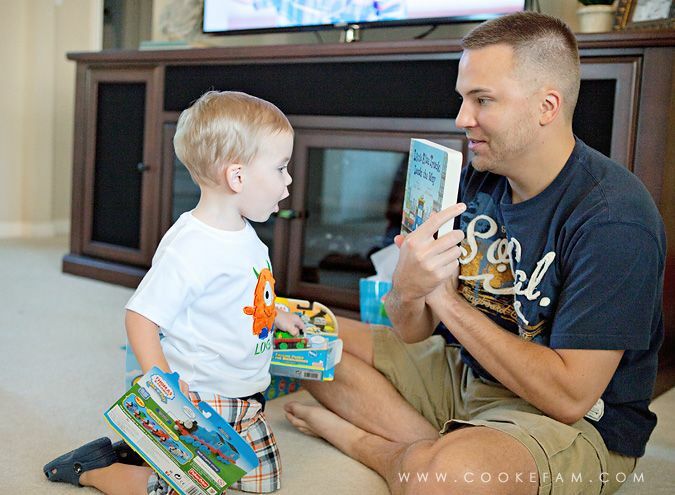 Buzz is Logan's favorite Toy Story character. The last toy to be brought out was one that was too big to be wrapped. We had it in the garage. 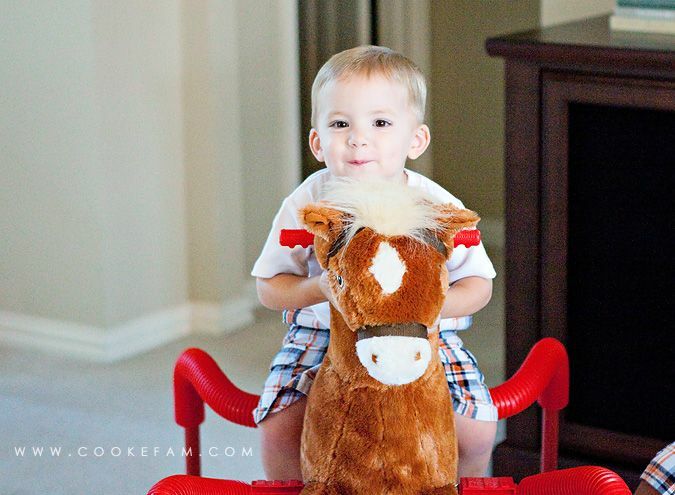 It was a pony from Mimi and Pop! Both of the boys absolutely love Lucky and love to ride him. They are pretty good about sharing him. Since they both like to dress up as cowboys, it's been fun to have Lucky for our cowboys to ride. 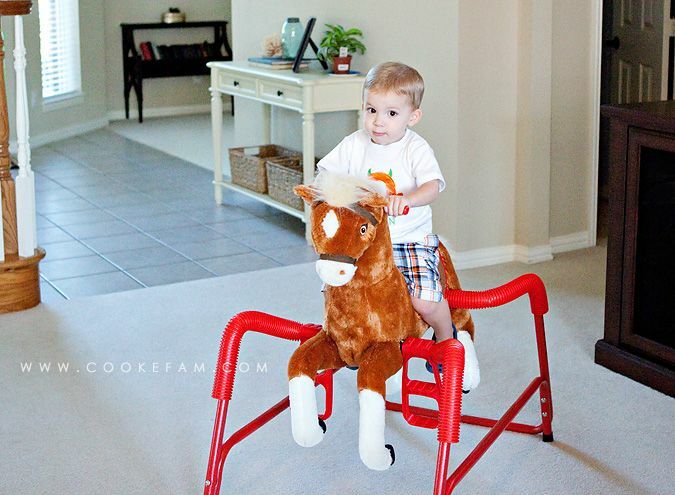 He makes galloping noises when you ride him and if you push his ear, he sings a song. 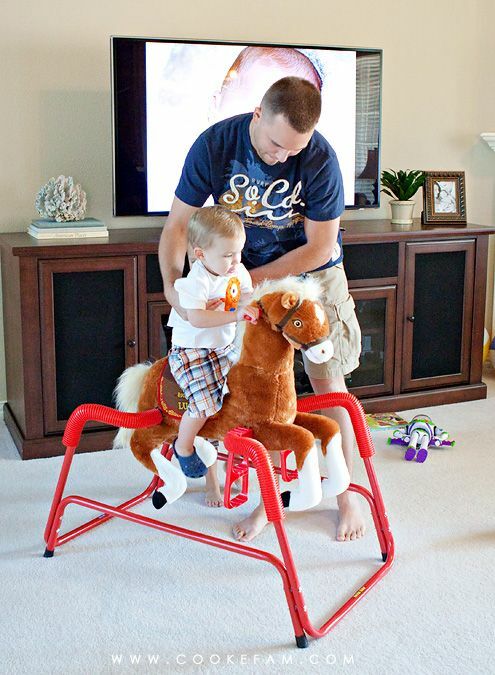 That photo above also captures a fateful moment...when Casey injured his back putting Logan on the horse. It seems innocent enough, but apparently his legs and feet were in just the right (or wrong) position when he twisted his back and he was pretty much incapacitated with severe pain for the rest of the party. No exaggeration. But, with a combination of ice, Aleve, and two visits to the Chiropractor that next week, he was back to normal. 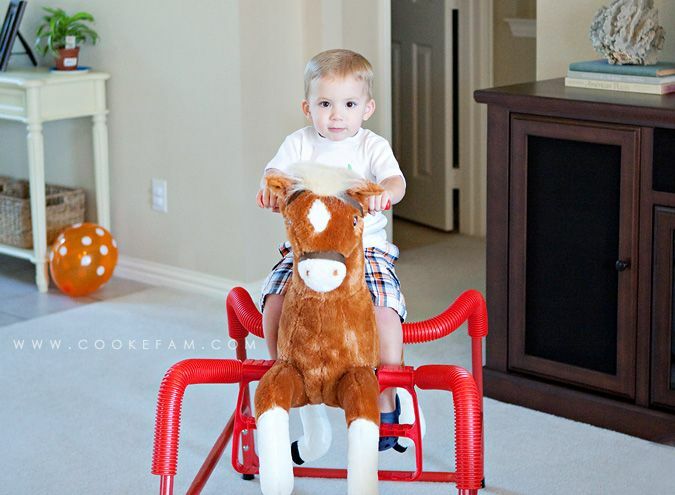 I think Logan rode that pony for a good 10-15 minutes without stopping. We weren't sure he was going to get off. Until I showed him a cupcake. Then he got down! 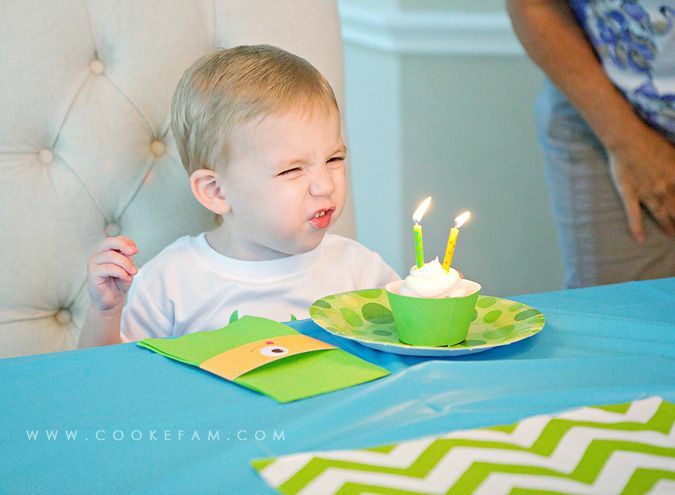 And he made the cutest, funniest face when he was blowing out his candles. A few days before, on his actual birthday, he was not a fan of the candles. 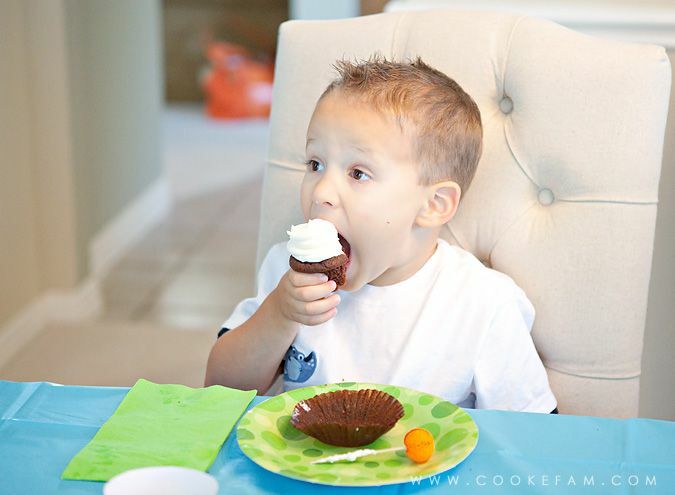 But when my mom put the cupcake in front of him at the party, he immediately knew what to do! The funny thing is that he was not actually blowing at all, even though he thought he was! Ethan helped him and together they blew out the candles. 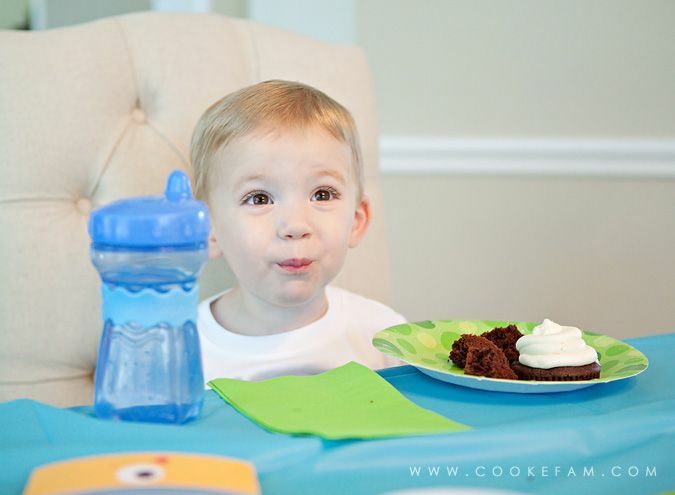 He wanted the cake, but not the icing. And that's not because he wouldn't like the icing. No, he's got a sweet tooth. 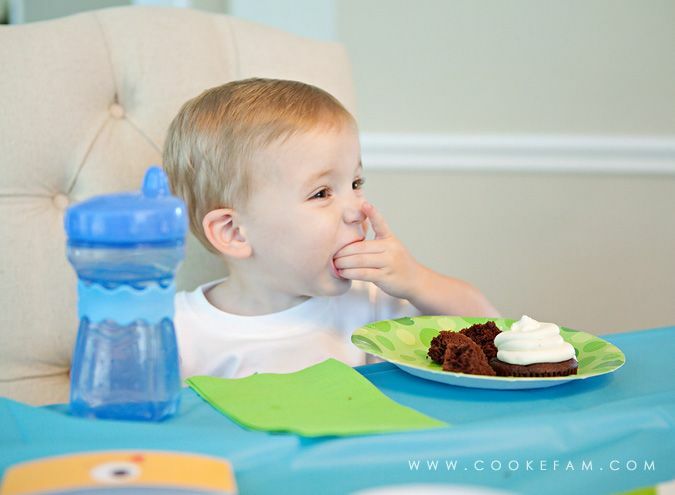 But icing is just different from the norm for him and Logan doesn't do different when it comes to food. After the boys ate their cupcakes (because they couldn't wait! ), we had the pulled pork sandwiches for lunch and then the adults had cupcakes too. 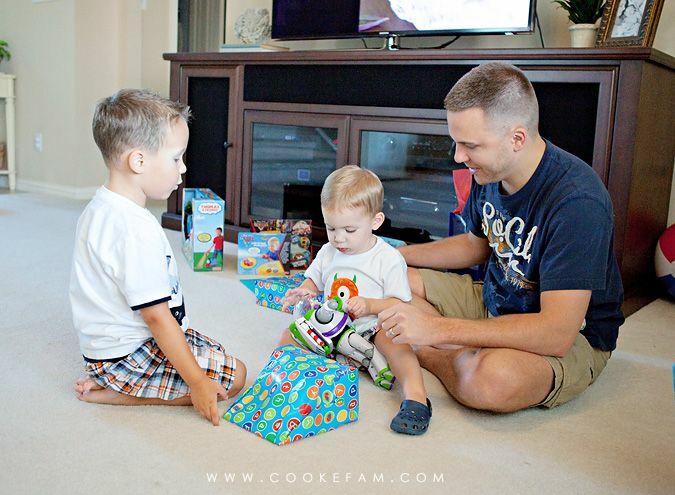 Everyone stuck around to watch the boys play with all of Logan's new toys for a while. We almost forgot to take our family photo, but aunt Chelsea snapped one for us before they left. I would have moved us to a better lighting situation, but Casey was doing well just to sit up on the couch (where he had been laying since he hurt his back). It was so fun and special to celebrate our little monster for a few hours with family. We are definitely thankful that we have Logan in our lives! Rachel, everything was perfect! 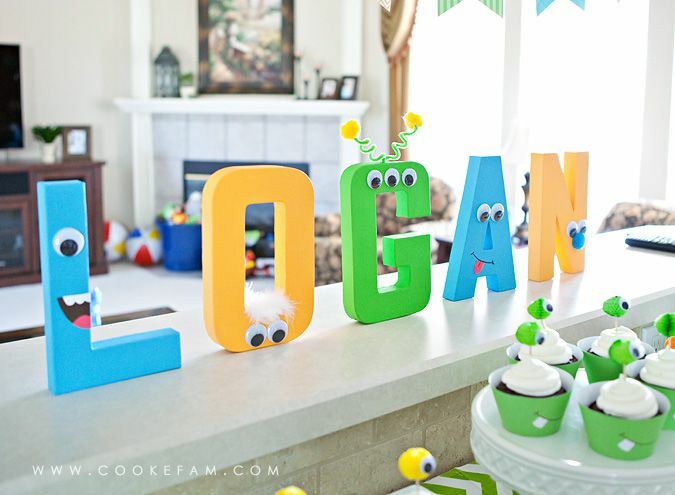 Love the monster letters and poms - you're so creative! You have given me some ideas for Brennan's 2nd! Precious!! Love that monster. Sorry about Casey. Glad all is well now. What a cute birthday party! I love the letters you made!